IUPAC President Leiv Sydnes (left) receives the FECS Award from FECS President Gábor Náray-Szabó. The FECS—Federation of European Chemical Societies and Professional Institutions—Award for Service was presented to IUPAC President Leiv Sydnes of the Norwegian Chemical Society, in recognition of his significant contribution to European cooperation in chemistry and the public appreciation of chemistry. 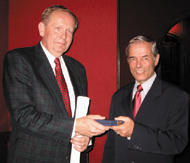 The Award, consisting of a medal and a scroll, was presented to Sydnes at the General Assembly of FECS member societies in Barcelona, Spain, in October 2003. Sydnes has been instrumental in developing the educational and professional activities of FECS and in promoting the European Chemist designation. He was recognized by FECS for his contribution to the public appreciation of chemistry, especially his focus on bringing the excitement and value of chemistry to children and to society in general. Examples include the numerous public lectures he has given and the prime-time television programs he has made for the general public on chemistry-related topics. He has been involved in FECS for 10 years, serving as a member of the Executive Committee, as vice-chairman of the former European Communities Chemistry Council, and as chairman of the European Chemist Registration Board. Sydnes has been involved with IUPAC for about 10 years. From 1992 to 1996 he served as president of the Norwegian Chemical Society. He has been professor at the University of Bergen, Norway, since 1993. Prior to that he was at the University of Tromsø. His research is currently concentrated on organic synthesis with emphasis on the application of cyclopropane chemistry and photochemistry to introduce useful structures into organic molecules.